In the vast and confusing world of cuts, brilliant round cuts are unsurprisingly the most popular form. Brilliant Round cuts maximize the brilliance of every diamond and are versatile to fit any budget. If you are considering a Brilliant Round cut stone, it is essential to be well informed of the pros and cons that come with the cut, the most suitable GIA grades for the cut, and the most sensical settings for the cut. This article will walk you through the in’s and outs, as well as the in between, of the Brilliant Round cut. The round cut itself has been around for centuries. It wasn’t until 1919 that Marcel Tolkowsky created what is now known as the Brilliant Round cut. Tolkowsky, knowing that a cut that is too deep or isn’t deep enough, would lose light as it traveled through the diamond. With this knowledge, he published a specific math equation to maximize the brilliance of a diamond and, in doing so, created the world’s most popular diamond cut – the brilliant round cut. When shopping for your engagement or wedding ring, keep in mind that there is a different between a round cut and a brilliant round cut. While gorgeous, the brilliant round cut remained unpopular for a long time – the work wasn’t worth what people were willing to pay and very few diamond cutters put in the effort to produce it. Lucky for us, recent laser technology has allowed jewellers and diamonds cutters to even out the playing field and create these beautiful cuts at affordable prices. Brilliant round cuts are popular, in part, due to their versatility which is a huge plus for this cut. These round cuts can be utilized on large or small diamonds, look good in essentially every imaginable setting and can be cut out of any stone or gem. As a result, the brilliant round cut is a go-to cut for brides and grooms with budgets that vary from $500.00 to $500,000.00 respectively. Durability and sustainability are two additional factors that make this cut extremely desirable. Brilliant round cuts lack the sharp edges of other popular cuts, and as such, don’t chip or break as easily as many others. The mathematical equation of Brilliant Round cuts also calls for 58 facets on the stone – these facts create reflections that maximize a stones brilliance. They also add another wonderful aspect to our list of “pro’s” – they hide imperfections. 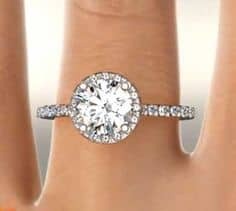 This aspect allows a bride or groom on a budget to get a stone with a lower clarity rating, and thus at a cheaper price, without sacrificing style and brilliance in doing so. In a few words, there really aren’t any. Any negative attribute that you might find in a brilliant round cut won’t cut from the ring itself but, rather, from the quality of the color or clarity of the diamond itself. Although brilliant white cuts are affordable as a result of their versatility, there are also more affordable cuts available. An ideal diamond for a brilliant round cut will be anything from SI2 and up. Avoid brilliant round cuts that fall into the categories of I1, I2 and I3. The ideal setting for a brilliant round cut is a 4 prong setting. A 4 prong setting will allow light to cut through the diamond and maximize the brilliance that the cut was made for. That said, for a larger diamond, a 6 prong setting might be necessary to avoid damage or looseness of the diamond itself. While a 6 prong setting might be a necessity for a larger diamond, a bezel setting is a popular option for smaller brilliant round cut diamond. A bezel setting is one in which the material of the band is actually constructed to the shape of the stone, holding the stone in place. While popular, and undoubtably intricate and beautiful, this setting type takes away the light that gives this specific cut the wow factor it was created for. Ok, so, what did we learn? The brilliant round cut is meant to maximize a stones brilliance and in doing so can hide imperfections of a diamond, there is a difference between the brilliant round cut and just a round cut, the best diamond for a brilliant round cut will have an IGA clarity grade of SI2-FI and an IGA color rating of D-G, brilliant round cuts range in price and this price is dependent on the clarity, color and carat size of your stone and the best setting for a brilliant round cut is a 4 prong – 6 prong if you have a large diamond – but a bezel setting is okay too, though not our first choice. Phew. 1. If your brilliant round cut stone is a diamond, deal only with reputable jewelers that will provide IGA certification.